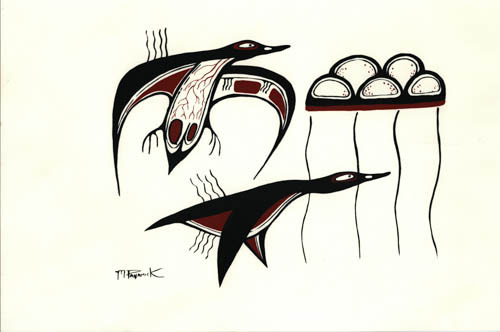 Martin Panamick was one of the artists from Manitoulin to work in the Woodlands School style. 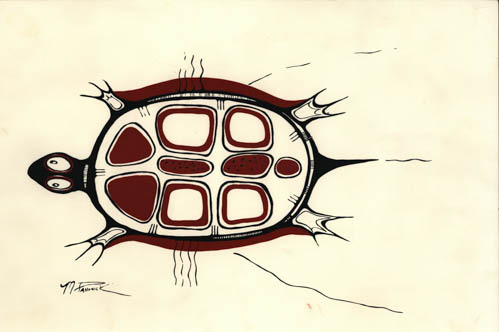 Panamick was born in 1956 in M’Chigeeng (shih-geeng) (then called West Bay) First Nation on Manitoulin Island. It is the second largest reserve on the island and is home to the Ojibwe Cultural Foundation (OCF), an organization dedicated to preserving local Anishinaabeg cultural heritage. Panamick painted two large murals for the M’Chigeeng Council chamber, and did graphic design work for the OCF. When he was ten years old, he attended the Manitou Arts Foundation summer school. Daphne Odjig and Carl Ray, two foundational Woodlands School artists, began the summer school to encourage young Anishinaabeg to consider pursuing art. The program was organized on Manitoulin Island, as Odjig herself grew up in Wikwemikong Unceded Indian Reserve, the largest reserve on Manitoulin Island and the only one that has remained in Anishinaabeg possession without government interference. Martin Panamick died in a car crash in 1977 at the age of 21. Though his creative career was short, he worked in a variety of media and produced art for a variety of purposes. He created silk-screen prints, like those here, India ink drawings, and paintings for galleries, but he also worked to promote and preserve his heritage by illustrating books. Panamick’s illustrations helped in the retelling and preservation of Ojibwe stories and traditions. The illustrations in Nishnabe Delights, a cookbook featuring Ojibwe and Odawa recipes collected on Manitoulin Island, placed cooking traditions alongside the story-telling and visual traditions.. His illustrations in Ko-Ko-Ko, the Owl, and Why the Beaver Has a Broad Tail continue to pass Ojibwe stories on to future generations and help Panamick’s influence live on.